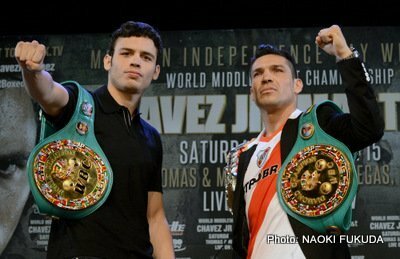 JC Chavez Jr. set the trap…has Maravilla already taken the bait? By Joseph Herron: Great trainers insist to every fighter who walks through their gym to leave all emotion at the door. The sport of pugilism is not about violence, but built on sportsmanship, discipline, and athleticism. Most decisions a fighter makes in the ring based on emotion almost always leads to a disappointing result. Adversely, every logical and intellectual judgment made within the hostile confines of the squared circle usually results in a satisfying performance and a victory. Leading up to this Saturday’s main event at the Thomas & Mack Center in Las Vegas, Nevada, featuring Sergio Martinez and Julio Cesar Chavez Jr, the fighter most affectionately known as “Maravilla” has been uncharacteristically carrying around a sack full of emotion based largely on pride, vengeance, and anger. Will the universally recognized Middleweight Champion decide to leave his emotions at the door of the Thomas & Mack Center this Saturday night? Team Chavez certainly hopes that he doesn’t. On July 14th, 2012, we witnessed a similar dramatic situation unfold in the ring. Just two months ago at the Mandalay Bay Resort & Casino, the collective boxing universe observed a usually cautious and cerebral Amir Khan guarantee a knock-out victory over WBC Junior Welterweight Champion Danny “Swift” Garcia in retaliation to several slanderous and disparaging remarks made by the title holder’s trainer and father, Angel Garcia. Leading into the highly anticipated match-up, most fight experts and boxing scribes favored the former WBA and IBF 147 pound champion to decisively outbox the Philly fighter due to the speed, punch volume, footwork, height, reach, and experience advantages over the young but undefeated Mr. Garcia. Logically, Amir Khan was universally considered to be the better boxer and more experienced fighter. Danny Garcia was thought of as the more powerful puncher, and only dangerous if invited into a slugfest. Unfortunately for the heralded HBO fighter, he let his emotions get the better of him in the ring, and got baited into a fire fight on the inside during the third round of their unification contest. How did this happen? Amir Khan allowed his passion to dictate his fight strategy, which ultimately left his chin uncovered and in harm’s way. Rather than electing to box his overmatched opponent from the outside while using the entire ring, Khan chose to vie for the dramatic and impressive knock-out. The heavily favored English born fighter paid a very heavy price for his lapse in judgment. On paper, Martinez enjoys the same advantages that Khan held over Danny Garcia. Maravilla will be the much more proficient boxer in the ring and should be able to keep Chavez at a safe distance for twelve rounds, using his jab, straight left hand, and masterful footwork. If the Argentine sharp-shooter merely utilizes his strengths, the logical outcome will be a unanimous decision victory or late round stoppage for the greater technical fighter. But will Martinez eventually succumb to his prideful and potentially damaging anger on Saturday night? Will the insulting remarks hurled by Team Chavez during the pre fight promotion influence Sergio’s decisions in the ring? Highly unlikely…Maravilla is a different breed of fighter who prides himself on ring intelligence and humility. 37 years of life experience will continue to guide the crafty southpaw down the intellectual path; it’s a trail that has ultimately led him to this crucial, star-making juncture. Don’t let the pre-fight venom fool you; Martinez is one of the smartest fighters in boxing and won’t detour from his premeditated road to glory. Expect to see the best version of Sergio Martinez this Saturday night. Previous boxing news: Would Chavez Jr. be popular if he didn’t have a famous father? You are here: Home / Boxing News / JC Chavez Jr. set the trap…has Maravilla already taken the bait?